Reggie Walser, Welcome’s best-known florist, has been arranging every kind of bloom since he was 3. And he’s not stopping anytime soon. Lane Hill can still picture her nephew, Reggie Walser, coming to her at family get-togethers nearly half a century ago, eager to arrange the flowers for her wedding. She smiled and donned her wedding dress while Walser picked his grandmother’s flowers, arranging them into a bouquet for his aunt’s “wedding.” Those early bouquets probably didn’t meet floral industry expectations, but for a 4-year-old with no training, they weren’t half bad. By the time Walser was 13, he had opened his own full-service floral shop — his parents made deliveries for him, since he wasn’t even driving yet — and he worked his first real wedding at age 14. 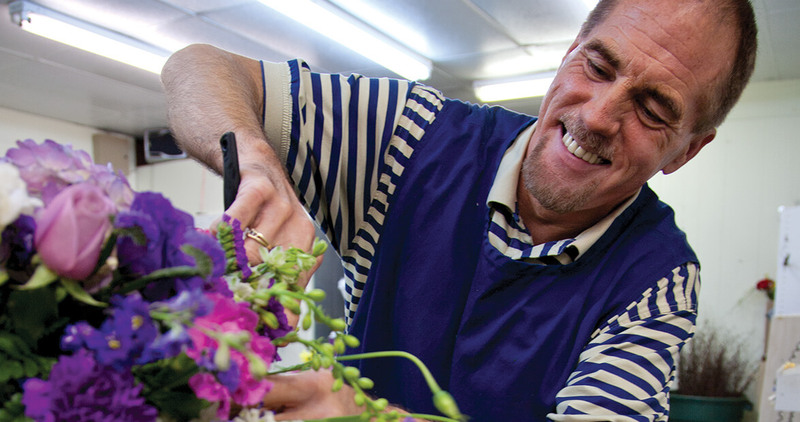 Today, Reggie’s Flower Shoppe, located in the Davidson County town of Welcome, has grown into one of the Triad’s best-known florists, drawing loyal customers not only from neighboring Lexington and Winston-Salem, but also from well beyond those two municipalities. He’s known as one of North Carolina’s most creative, successful flower arrangers, a claim that’s supported by a couple of significant awards — the N.C. State Florist Association’s Designer of the Year and, most recently, Florist of the Year honors. High-profile clients, such as Richard Childress and Junior Johnson, have relied on him for years, and he’s even arranged flowers for a movie, The Fifth Quarter. Will it be worse than Valentine’s Day, when the shop made 380 deliveries in a single day, and had dozens of in-shop pickups? Probably not. Don’t be fooled. Valentine’s Day may be stressful, but remember, this is a man who has been in the floral business more than two-thirds of his 50 years. When “Valloween” comes calling every February, the volume of business may ratchet up the stress level for Walser and his eight full-time employees — including Hill, who now works as her nephew’s bookkeeper — but it doesn’t frighten him. It energizes him. From the time he was a little boy growing up in Arcadia, flowers and family have been the two constants in his life. His late mother, Peggy, used to buy silk flowers for her son to arrange. In high school, he often arranged centerpieces for athletic banquets and other events. When Walser was 13, he decided to make some memorial arrangements for the cemetery for Easter, and he told his father, Graham, that he wished he had a building to work in. His father found him a building, and the owner let him use it rent-free because he was so impressed by Walser’s ambition. He ran the shop until his senior year in high school, but closed when the building’s owner died. He took a job at Sides Florist in Winston-Salem for 19 months, then opened his shop in March 1982. Today Reggie’s is not so much a local business as a community institution. He’s that way with everything, whether it’s a simple arrangement for a birthday party; multiple arrangements for a grand wedding; or his annual Christmas open house, which draws hundreds of visitors and last year featured 10 Christmas trees and about 200 wreaths and other Christmas-themed arrangements. He wanted perfection when he arranged the casket spray for his mother’s funeral — “She wouldn’t have had it any other way,” he says — and he wants perfection when it comes to his own funeral. He’s already written down what he wants for the visitation and for the service. That makes sense. The floral industry may be highly seasonal, but Reggie Walser? He’ll always be here. Hours: Monday – Friday, 9 a.m.-5 p.m.; Saturday, 9 a.m.-1 p.m.; Sunday, closed.